Compare the stats & general application in this comprehensible weapon list for all Sniper Rifles available in PUBG Mobile. Sniper rifles are very powerful and effective in long range engagements. They can deal massive damage especially when head shots connect, so always aim for an enemy's head area. 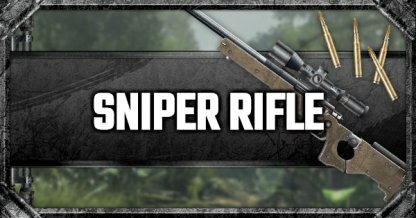 Sniper rifles in general have a slow bullet speed, so be sure to lead your aim and predict enemy's movement. This single bolt sniper rifle fires 7.62mm rounds that can one-shot players in rank 2 headgear. Relies heavily on scope and skills, though. Obtained from air drops. A great single bolt sniper rifle that fires 7.62mm rounds. Second only to AWM and can one-shot players in rank 2 headgear. Heavily relies on scope and skills. Obtained from air drops. The most powerful single bolt sniper rifle and fire unique magnum rounds. Deals extremely high damage and ignores rank 3 headgear. But only for long distance, of course. Fires .45 rounds. Very powerful and fast, but cannot be equipped with scopes.